Trying to determine the lesser of two subject evils as I'm attempting to remove my current EFR IWG 7670 turbo assy from the engine. Ultimate goal is to swap in an IWG 8374 assy, which seems basic enough if I can somehow get the 7670 unit out of there. Unfortunately, there's not enough room to just pull it off the OEM studs as it sits now. Regarding subject options, I believe there's enough room to do the two nuts approach in removing the engine-to-exhaust manifold studs. But just wondering how successful/difficult that is to achieve. The other option mentioned to me is to remove the passenger side engine mount-to-subframe nut, and jack the engine up on that side. I believe this would also do the trick, and is likely what was done initially to mount the turbo assy. But is this as easy as it sounds or is there more to just removing a subframe nut? Btw, sincere apologies for my newb question. I'm genuinely trying to do my part to finally get in better touch "mechanically" w my FD considering I've always farmed out most things until here, including simple oil changes (gasp!). Note: '93 USDM original owner, 235k glorious miles, yada-yada-yada. Last edited by Topolino; 01-27-19 at 10:00 AM. How did you get it in there in the first place? Forgiveness for asking the obvious, but have you tried removing turbo from manifold? Thanks for reaching out....It's a Turblown kit w their cast ss, short runners manifold. I *believe* it's only practical to get to 3 of 4 nuts due to the very tight fit once assembled/installed. But that was def another option I considered. Have done it this way, the car was on a hoist, then lowered onto a floor jack, for best vision. A narrow, short piece of wood along the sump pan bolt line was used as the jacking medium. The engine mounts here swivel at the mid point, which makes this operation easier....stockers, or solid urethane ones, might present problems. Need to watch going overboard, the power steering pump will contact the relay box and crush it probably, if you go nuts! (not sure if the A/C might prove an issue - none here). Another way is supporting the engine by a bar from the weather channels up top with chains and dropping the subframe.....wouldn't like to do that on anything but a hoist. I tend to like installing manifold and turbo as one, to ensure good torque on all four nuts, always that final half turn you can't get otherwise. that's odd I didn't have any issues installing or removing the 7670 efr on my FD, with it attached to the turbo manifold, both times. is this car rhd or something? Last edited by KompressorLOgic; 01-27-19 at 09:24 AM. Hey, thanks for chiming in! Mine's a USDM model. Interesting on your setup having no issues. Same Turblown short runners cast manifold, too? I lowered the car off the jack stands to see if I was unwittingly causing the side clearance issue, but to no avail. If the OEM studs protruded only half as much, I think I'd be in business. shot u a PM with a couple pictures, the heater hardline must come off or id imagine it interferes. Appreciate the photos and assist! Your setup appears to have just a tad more room for some reason. Mine is catching on the hot side via resistance from the engine bay as it contours right at that spot unfortunately. I had an old aspec kit that was a squeeze. I did the loosen the passenger mount trim but instead used a ratcheting strap to the upper shock bolts, just put a nut at the top so the strap hook doesn’t slip off. I have to remove the forward upper stud to remove my turbo assembly with messing with anything else and I'm using an s366 with the tremendous compressor housing. Without removing the stud the manifold just just just barely won't clear the rest the of the studs before hitting the chassis. 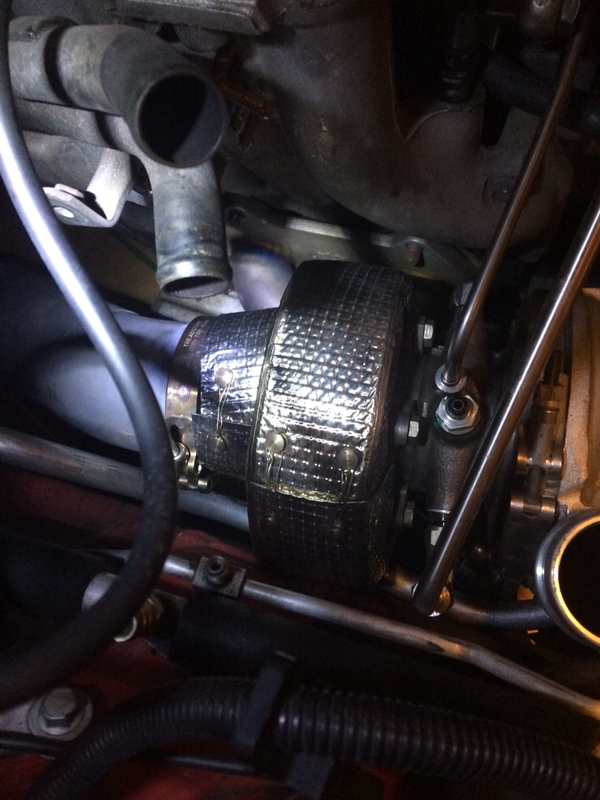 With the stud out, it allows for just enough twist space to remove the turbo and manifold as an aseembly. When I rebuilt my motor I put new studs in with copper antiseize so the 2 nut method works very easily for me. If your studs are in bad shape then it's possible you will break it trying that method and you'll be in an even worse position. The nut that hold the stock motor mount is as simple as it looks. There's a stud thats actually part of the mount itself that just goes through the subframe. The nut keeps it secured. If you remove the nut then the motor is free to lift, to an extent. There are quite a few parts that would keep the motor from lifting enough to give you sufficient clearance. It really all depends on how deep you're trying to go. My suggestion is the 2 nut method to remove the stud. It's the least invasive as far as removing X to get to Y. I caution you though, soak the stud is a penetrant of some kind like pb blaster or liquid wrench and go slowly when removing it. As you remove it, the stud should heat up from from friction. Once it gets warm-ish, stop and let it cool down and spray more penetrant on it. You do not want to break this stud. If you have a ratcheting wrench, it would be best to use that. what I do is put the wrench on the nut and then put the second nut on basically sealing the wrench between the 2 nuts and then I remove it. When I take it out, the stud and 2 nuts are an assembly and I leave it like that until I go to put it back in. Appreciate all the good feedback and guidance; including those who reached out w applicable PMs. I initially tried delicately jacking the engine using the first option but still found resistance. Seeing as how I was very close, I bit the bullet by trying to remove the studs. Surprisingly, each one removed with relative ease (compared to my fear of having one break off). With the studs removed, I still had some slight difficulty getting the whole assy out of there. But I eventually managed to remove the unit unharmed. Moving forward, I think I'll go w studs on the bottom (new manifold is slotted there) and bolts on the top to help make things more efficient should I need to do a similar effort in the future. Not gonna lie. I couldn't have done this project wout the support of the forum community members that chimed in as I am somewhat auto-mechanically averse (but trying to learn and get better). Thanks, again! Exhaust Manifold - Remove Studs?